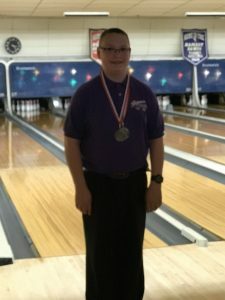 Carter Quinn said this was the first tournament he ever bowled, it’s a good bet it won’t be his last after his performance in the 7th Annual Middle School Singles Tournament that was held on Sunday, May 21st at Colonial Lanes in Flushing. Carter is from Lake Orion and he qualified 16th overall and worked his way through the field to win the boys side of the tournament with a 244 to 219 victory in the finals over Alexander Pierce from Kearsley. The other 2 bowlers to make it to the final 4 were AJ Crandall from Oxford and Noah Boice from Lake Orion. Final 4 Boys from left to right – Tournament Champion Carter Quinn, Runner Up – Alexander Pierce, semi finalist AJ Crandall and Noah Boice. The high qualifier for the tournament was Jacob Field from Byron who started the day with a bang as he had a 242 actual the first game of qualifying, it held up as the highest game of the day in the tournament. Jacob had a 730 with handicap for 3 games, he went on to win his first match before bowing out in the final 16. Jacob received a medal for being high qualifier and a medal for having the high boys game of the day. 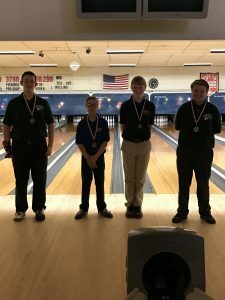 Jacob Field – High Qualifier and high game of the day. 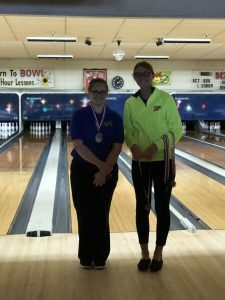 On the girls side Allison Eible from Kearsley started the day out with a 212 actual and didn’t let up as she had a 583 actual series and a 724 with handicap to qualify #1 overall for the girls. She ran into a tough teammate the first round and was eliminated in the final 16 but received a medal for high game of the day and a medal for being the high qualifier. The girls side was also an exciting finish as 16 seeded Rhyan Langon-Yaklin won her first two matches to move into the final 4 before running into a tough Molly Winson from Byron who qualified 4th overall and worked her way through the field and defeated Victoria Ritchie from Kearsley in the finals by a score of 243 to 195 to win her first tournament. Molly’s scores in her match play games with handicap were 245,235,260 and 243. The other semi finalist for the girls was Cassandra Gilley who qualified 11th overall and made it to the final 4 before losing a close match to Victoria Ritchie. Congratulations to Carter and Molly on your Singles Tournament Victories today. A great turn out for a great tournament as we officially had 88 entries for this singles tournament, one of the largest turn outs in the 7th year of middle school bowling.